Dj Sashanti aka Alexander Sukhochev was born on 19th of November 1977 in the Soviet Union in a rebels family from the 70's of past century. In his early youth, he started to collect electronic music which was completely unfamiliar phenomenon at that time for ex-Soviet Union and nearly impossible to find. The collection was loaded with tracks from the gurus of new vibes. It was precisely that pioneering of electronic music that influenced Alexander to choose the style for himself. The debut as a dj was in the beginning of 1996 while finishing his higher education as a journalist. He played in various clubs and together with friends found an event management company named "VK-promo" which was famous for its numerous events in the central part of Russia. In 1997, Alexander worked as a freelance journalist for the unique at that time in Russia advanced music magazine "Ptiuch", which portrayed modern sound, style and fashion. In 1998, "VK-promo" made one of the biggest event for young journalists, djs and musicians in Russia in collaboration with the "institute Open Society" of George Soros, USA. In 1999, he moved to Moscow where he combined work in the Russian Union of Journalists with event management in metropolitan night clubs. From 1999 to 2004, he had bookings all over Russia that was a huge turn in his life. It was the start of Alexander's dj career, though it remained his hobby and passion till the present moment. In his record are many gigs at various clubs in different cities and countries, open-airs, private boat-parties, etc. let alone arranged by himself events in Moscow and St. Petersburg. Dj Sashanti records soon became an absolute knockout and without doubt the rhythms he spun caused many hearts to fall in love with the ultra-fashion styles of house music. In 2004, he signed a contract with an Indian Travel Company and made his way to the mother of the world, India. The first chapter of new life started in India's sunshine state Goa, where Sasha was working with Russian tourists during the day time and switching identity after sunset to become dj Sashanti in a new club named "The Beach Hut". Very soon it became the get-together place for all the party-people in South Goa. Popular demand brought Alexander to North Goa, where he played for the opening party of Goa's first international Film Festival at the Beach Lounge "Utopia". And from there on the list is growing endless - Club Cubana, Tito's, Mambo, O-Zone, On The Rocks, Lounge Fly etc. But the most enjoyable period of his life was when he was driving around India with the sound system in his car, just stopping wherever he wanted and making the best parties just for the love of house music. At the same time he became a resident dj of the brand new lounge Caravela in Taj Holiday Village Goa assigning their original musical format. Among the formal endless list of parties the one's which stand out are the parties for the Russian Consulate in Mumbai, Chivas, All India dj's Master Mix, Baccardi Blast, the opening performances for the Big Chill Goa 2007, Sunburn 2009 festivals in Goa and Sulafest-2010. In 2007 he released his first book called "The Goan Syndrome" that went on to become the bestseller of the year in Russia. He supported the book by touring and playing in many Russian and Ukrainian clubs. 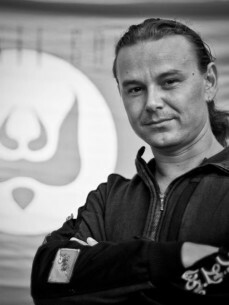 In 2008 Alexander became a new owner and art-manager of trendy beach establishment Shanti Goa on Aswem beach which is winter residence of top Moscow lounge-restaurant also named Shanti. He brought to people new image of luxury beach shack with a fresh idea of multi-format beach club-restaurant in Goa. The same as he mix different tracks in one beautiful set Sashanti succeeded in combining a restaurant, a high-end cocktail bar, a dance floor, a massage parlour, a tearoom, a cinema, an art-gallery and a beach sport-centre. Shanti Goa has become a must-visit place in North Goa, not only among the tourists but also among residents and expats who live permanently in Goa and a creamy layer of people from the biggest Indian commercial and cultural centers such as Delhi, Mumbai, Bangalore etc. In the passed season Malini Ramani created exclusive collection of clothes for Shanti. The dance floor was shredded by such big names as Cheb-I-Sabbah (USA), Mathew Jonson (Canada), Katrin Vesna (Russia), Jalebee Cartel (India), Tiago Oudman (Portugal), Wolf+Lamb (USA), Talvin Singh (UK), Pawas Gupta (Germany), Tatva Kundalini (India), Bjoern Wilke (Germany), DHR Robijn (Holland), Digital Samsara (Israel), K.Moss (Germany) and Electric Zoo dj-team.